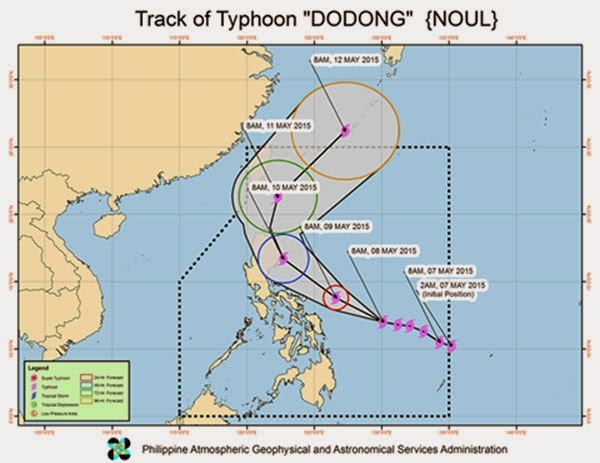 Typhoon Dodong 2015 weather forecast from PAGASA is posted here. Browse this page for a news update on Bagyong Dodong as of Friday, May 8. 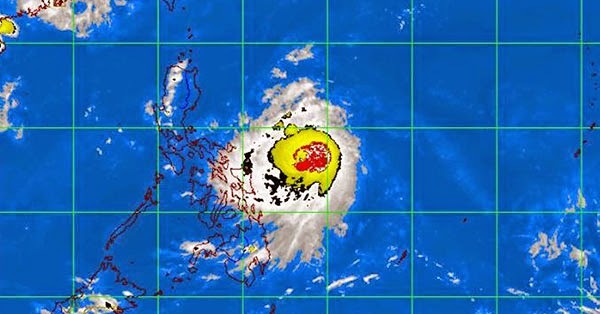 In its severe weather bulletin issued this afternoon, the Philippine Atmospheric, Geophysical and Astronomical Services Administration said the tropical cyclone has accelerated but maintained its strength. As of 4 p.m. today, Typhoon Dodong was spotted 510 kilometers East of Sorsogon City with maximum sustained winds of 150 kilometers per hour (kph) near the center and gustiness of up to 185 kph. It is moving West Northwest at 20 kph. Public storm warning signal number 2 has been raised in Catanduanes. PSWS #1 is up in Sorsogon, Albay, Camarines Norte, Camarines Sur, Quezon, Polillo Island, Aurora, Quirino, Isabela, Northern Samar and Eastern Samar. State forecasters said heavy to intense rainfall is expected within the 300-km diameter of Bagyong Dodong. Wave height is 1.25 up to 4 meters. Typhoon Dodong 2015 is expected to be 160 km North Northeast of Virac, Catanduanes by Saturday afternoon.